Snippets of Jack: "Dying is the day worth living for." Now that Pirate King Elizabeth Swann has mobilized the Brethren Court with her beautiful speech, she's ready to take on Beckett and his men. All the while, Calypso is making a great big storm in the sky complete with lightning and thunder. And like any rational people would do, the Black Pearl and the Flying Dutchman chage head first into the danderous storm. Gibbs is the first to annouce the ovious: "Maelstrom!" Now incase you don't know what a maelstrom is, as I did not at first. It is a huge whirlpool. So this giant spinnig whole kinda freaks out Elizabeth (who is still on the Black Pearl rather than her own ship). So she looks to the great Hector Barbossa for help, who is strangely just staring at his hand. 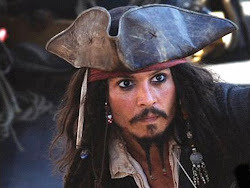 Elizabeth: "Captain Barbossa! We need you at the helm." Barbossa glares at the female pirate for a little while, and eventually relents. Barbossa: "Aye, that be true." Such humility amoung pirates. So he stomps over to the wheel, pushing Cotton aside in the process. Barbossa: "Brace up yards, you cack-handed deck apes. Dying is the day worth living for!" Wise words by Captain Hector Barbossa, Pirate Lord of the Caspain Sea. So finally under good hands, (although not Jack's because he's been locked up on the Dutchman thanks to a certain someone) the Pearl continues onward. Meanwhile, on the Dutchman, everyone is freaking out about the giant whole in the middle of the sea with lightning constantly striking it, well everyone except Davy Jones, who seems to think it's no concern to him. Yolo! (Sorry, I had to.) It's during this time that Will and Elizabeth prove to everyone how demanding and bossy they are together. Boy do I feel for William Turner III. Will: "Take us out or they'll overbear us." Barbossa: "Nay. Further in. We'll cut across to faster waters." Elizabeth: "Prepare to broadside!" Gibbs: "Captain the guns. Bear a hand." Will: "Muster your courage, men. At the ready." Seriously, this is one of my favorite scenes of the whole series (which explaisn the many posts on it!). It's just so epic and intense! You've got the rain and the screaming and the engergy and the music! Gibbs: "Batten down the hatches! Stand to your guns. Midship cannoneers, sight the masts." Gibbs is running around the whole ship, rightfully giving orders to the frantic crew, unlike another couple I know . . . And finally, know that the whole crew is loaded, the firing begins. Now, if anyone on earth did not notice that they were meant to fire, they really must have been out of it, because first Barbossa yells: "FIRE!" Then, Elizabeth: "FIRE!" Then Gibbs: "Fire! Fire! Fire all!" And then over to the other side. Davy Jones: "Fire!" Now back the Pearl. Will: "Fire!" Can we say it a few more times maybe? Gibbs: "Come on, men." Joshamee Gibbs, a man of great encouragement. Barbossa: "It be too late to alter course now, mateys." Thank you Captain obvious. Why are the only things that ever come out of Hector Barbossa's mouth either extremely obious or extrememly hard to follow. I can speak Jack, not always Barbossa though. And then of course, this nonsense is followed by his constant cackling. Not to mention, no one is even listening. But he make his point clear, Elizabeth has lead the Brethren Court to the point of no return.